FORT LAUDERDALE/DAVIE, Fla. – Valentine’s Day is almost here. If you’re stuck trying to find that perfect gift for your someone special, researchers at Nova Southeastern University’s (NSU) Guy Harvey Research Institute (GHRI) may have just the thing: a tagged female mako shark swimming off the coast of North Carolina who is looking for a name. 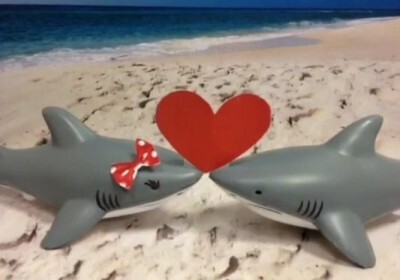 Just in time for Valentine’s Day, research scientists at NSU’s GHRI and the Guy Harvey Ocean Foundation are offering the chance to name this shark to not only give your loved one something very few have – a shark named for them – but also as a way to raise funds for shark research and ocean conservation. It’s the gift for that someone special who already has everything. Researchers from NSU’s Guy Harvey Research Institute tagged the mako in late August off the coast of Rhode Island. Currently named ‘170866’, this mako has traveled 1,794 miles in the Atlantic, without an official name. 170866, along with other GHRI tagged sharks, can be followed online in near real-time at nova.edu/sharktracking. To officially name 170866, contact Jacoski at greg@guyharvey.com or call 954-424-6389. The $5,500 donation to name the shark sponsors the tag, which transmits vital data that is used by researchers as they study these apex predators. In addition to the naming rights, the sponsor also receives an official naming certificate and a framed print by Dr. Guy Harvey. About NSU’s Guy Harvey Research Institute: Established in 1999, the Guy Harvey Research Institute (GHRI) is a collaboration between the renowned marine artist, scientist and explorer, Dr. Guy Harvey, and Nova Southeastern University’s Oceanographic Center. The mission of the GHRI is to provide the scientific information necessary to understand, conserve, and effectively manage the world’s marine fishes and their ecosystems. The GHRI is one of only a handful of private organizations dedicated exclusively to the science-based conservation of marine fish populations and biodiversity. The research, education and outreach activities of the GHRI are supported by the Guy Harvey Ocean Foundation, AFTCO Inc., extramural research grants, philanthropic donations by private businesses and individuals, and NSU. Please visit nova.edu/ocean/ghri for more information. About Guy Harvey: Guy Harvey is a unique blend of artist, scientist, diver, angler, conservationist and explorer, fiercely devoted to his family and his love of the sea. His childhood passion for the ocean and its living creatures not only inspired him to draw, but fueled a burning interest that prompted a formal education in marine science. Having graduated with honors in Marine Biology from Aberdeen University in Scotland in 1977, Guy returned home to Jamaica to resume his education, earning his Ph.D. from the University of the West Indies in 1984. Though he gave up a budding career as a marine biologist for that of a highly acclaimed artist, Guy has continued his relentless pursuit to unravel the mysteries of the sea, traveling the world to better understand the habits and habitats of the marine wildlife he paints. For more information, please visit www.guyharvey.com. About the Guy Harvey Ocean Foundation: The Guy Harvey Ocean Foundation (GHOF) conducts scientific research and hosts educational programs aimed at conserving the marine environment. The GHOF also funds affiliated researchers working to better understand our ocean ecosystem and educators helping to foster the next era of marine conservationists. The GHOF will help ensure that future generations can enjoy and benefit from a properly balanced ocean ecosystem.